We got new neighbors last weekend (total bummer to be moving New Year weekend) – and I’ve been waiting until the dust settles next door to bring over some baked goodies and say “hello!”. My super awesome talented cousin posted this recipe on her blog today and I decided it was perfect for saying “Welcome to the neighborhood”. I was inspired to make this lemon curd by three things. 1. My cousin Shannon posted this recipe on her blog. We both love allrecipes.com — they have awesome stuff there. 2. I have several lemons rapidly getting closer to serving no purpose but attracting fruit flies. 3. Lemon curd is awesome and delicious. As per most get-togethers, I was asked to bring my scones to this weekend’s bridal shower. However, there was some discussion as to which variety. 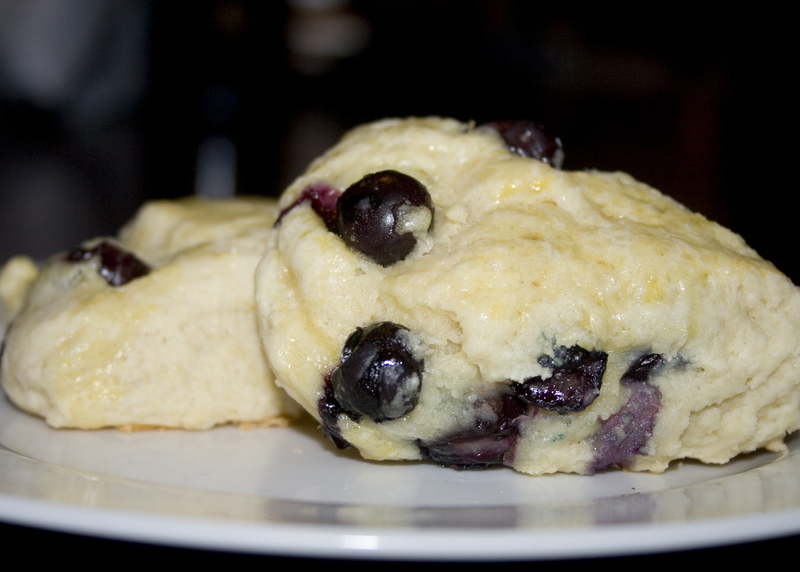 My two sisters wanted chocolate chip as well as blueberry scones. But my nanny and mom are partial to the cranberry orange version. So – I made all three. 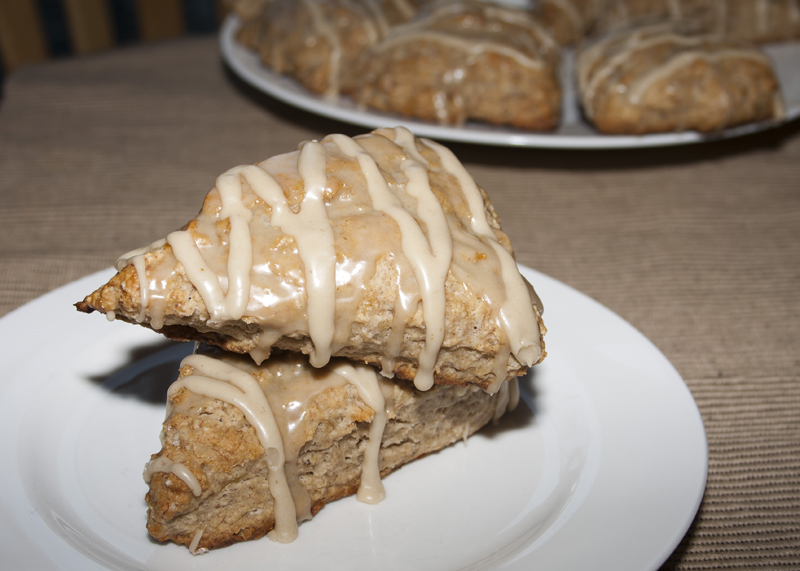 Since I’ve already posted shots of the chocolate chip & blueberry in my post of the main recipe for these scones – here’s just a photo of the cranberry orange. Zest of one orange and 1 c dried cranberries. Glaze of fresh squeezed orange juice, zest and powdered sugar. I have pretty much become famous off these scones – at least in my small corner of the world. My sisters ask me to bring them to anything they can: camping trips, brunches, bridal or baby showers, Mother’s Day, treat-day at school. You name it, I’m asked to bring these. The sour cream and baking soda combo makes the texture perfectly airy and yet still moist. The possibilities are endless for mix ins – try whatever you fancy! Optional Egg Wash: For a golden color when baked, mix one egg yolk with a little water and brush on scones prior to baking. 2. Preheat oven to 355° F. Lightly grease a large baking sheet. 3. Cream the butter and sugar in large bowl. Beat the egg with vanilla and add to the sugar/butter mixture. 4. Sift the flour, baking powder, cream of tartar, and salt. Add to the butter/sugar mixture – do not overmix. 5. Stir the sour cream mixture into the flour mixture until just moistened. 6. 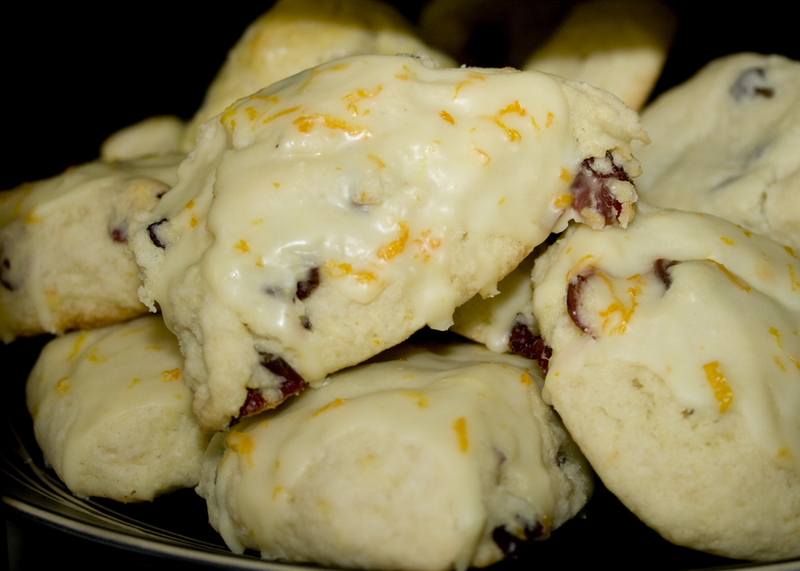 Mix in any toppings – for orange/cranberry scones 1 C dried cranberries and the zest from one orange. 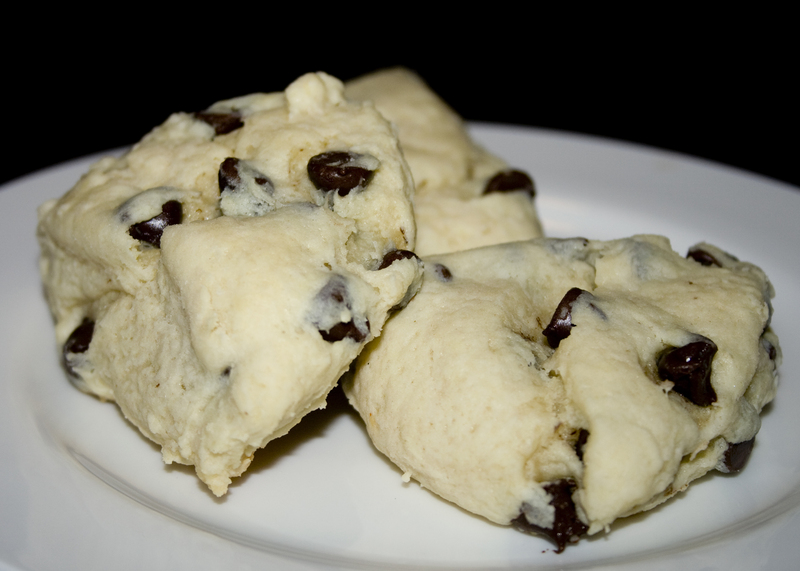 For chocolate chip scones, 1 C mini chocolate chips. 7. Turn dough out onto a lightly floured surface, form into a ball. Cut in half. Roll or pat each half into two 3/4 inch thick rounds. Cut each into 6 wedges, and place them 2 inches apart on the prepared baking sheet. 8. Bake 14 to 18 minutes in the preheated oven, until golden brown on the bottom. 9. Allow to cool completely on wire racks. Glaze or top as desired. For orange glaze – orange juice, zest and powdered sugar until desired consistency.